What is SEGA trying to do to me? Do I even want this game, really? I don't know. 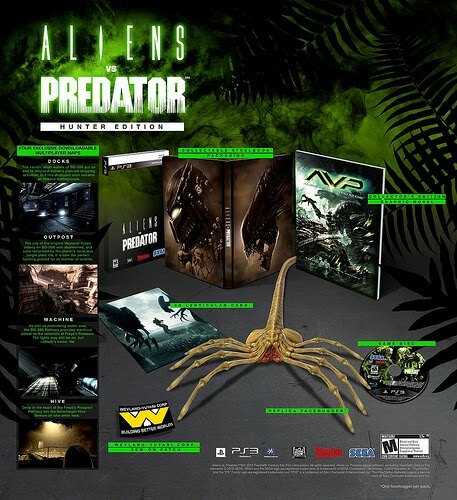 I've been burned by both franchises in games before, but they did put out a couple of good AVP games before the movies came out. Now they are throwing in a bunch of goodies as special bonuses for paying extra to get the collectors editions and they made me want to spend the damn money. Once you throw in a face-hugger I want it. Hunter Edition confirmed for US consumers! There, I can finally say it; the Hunter Edition which was announced fairly recently from our European friends is now 100% confirmed in the US with an added bonus – a hardcover graphic novel from Dark Horse Comics featuring the original Aliens vs Predator comic! 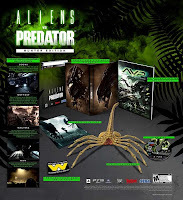 Don’t worry, all the other goodies are still included, such as the four Multiplayer maps (before they release to the general public), a fully articulated and disturbingly creepy Facehugger model, Weyland Yutani sleeve badge, and a 3D lenticular postcard. To sweeten the deal, if you pre-order you can pick up some exclusive skins for all three species in multiplayer. Yeah, I want this one bad. Check out a larger image of the packaging below the jump.